In the second of the short videos in the 11 part series on how to create motivated employees, I share the first of 10 key factors that when present will collectively enhance the motivation of your team members/employees. How would you rate for this factor? For more information on all 10 factors and the underlying belief, visit the OTM Academy. Over and over in the programs that I facilitate for both Senior and Developing leaders I am asked this question, "Gary, how do I motivate my team members?" Below is the first short video in a an 11 part series that answers this question. Join the OTM Academy here. 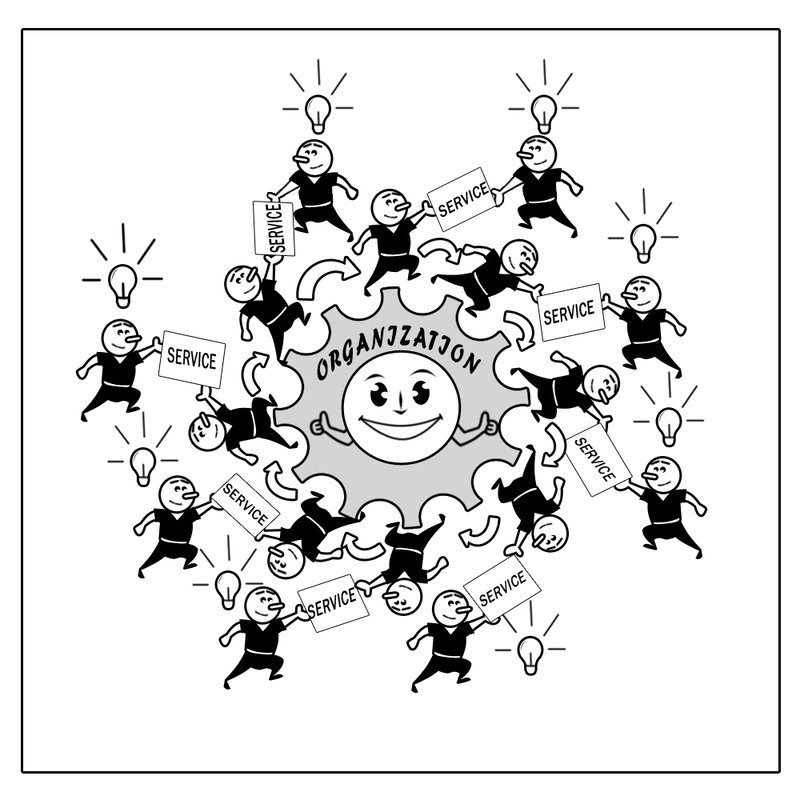 Good service organisations connect their staff to the organisation in many ways. Staff feel a regular and consistent level of achievement, job security and engagement with their organisation when service is alive and well. In this context, service lives from staff member to customer, staff member to staff member, manager to direct reports, direct reports to manager and so on. Staff may even be connected to the organisation after they leave. This is also good business. Good service organisations understand that it is better to train staff and have them leave than to not train them and have them stay. Some jobs simply aren’t for life – and shouldn’t be! The nature of some jobs is that the staff performing the roles should develop and move on from the role. If it is possible for them to move inside the organisation, then those opportunities will be provided. Often, the staff member needs to leave the organisation to continue to develop. This is okay. Maintaining a connection with ex-staff can create a larger customer base, opportunities to move into new markets and a potential network of like-minded people who can sporn opportunities to and from each other. There is nothing wrong with being explicit about these hopes when good staff leave. Once again, it is simply good business. 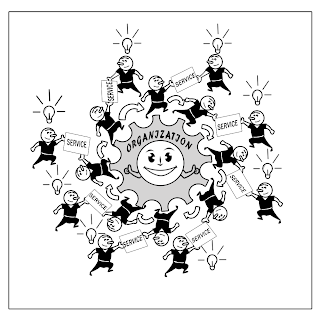 How are your staff conencted to your organisation? 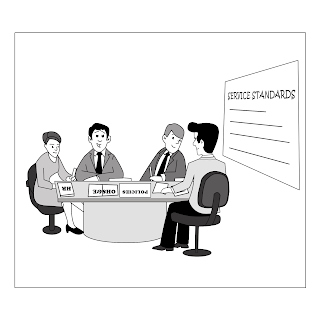 "All internal efforts, programs and processes have to be geared towards maintaining or improving the external performance of the firm"
When a fellow passenger called out, "My God they're throwing guitars out there!" Canadian singer/songwriter Dave Carroll was horrified when he realised the guitars were his. With his guitar broken and horribly damaged Dave spent 12 months chasing United Airlines to pay for the damage they had caused. With nothing less than indifference, United Airlines did not offer a sincere apology nor did they fix his guitar and repay Dave for the cost of repairing his equipment. So Dave and his band, Sons of Maxwell, did what they do best. They wrote a song (and then a second one) about their experience and released it on YouTube. The song was an immediate YouTube 'hit' and you can see that there have been currently over 10.5 million 'hits' on the song. Within a day of the release of the song United's share price had dropped by 10%. The value of the drop in shareprice could have bought Dave 51,000 guitars. The moral of this story is that we live in exponential times. Not every story will go 'viral' - but you just don't know which ones will. If a company gets something wrong, which does happen from time to time, then the best thing to do is to fix it as fair and fast a way as possible. The OTM Service Strategy® is a system that has been designed to enhance an organisations capacity to provide a consistent and continuously improving system for service excellence. Contact me if you would like to arrange a conversation regarding how the OTM Service Strategy® could benefit your organisation. Understanding expectations is the starting point for great service. If you don’t understand the expectations of your customers, then everything that you do is likely to contribute to failing to meet them. 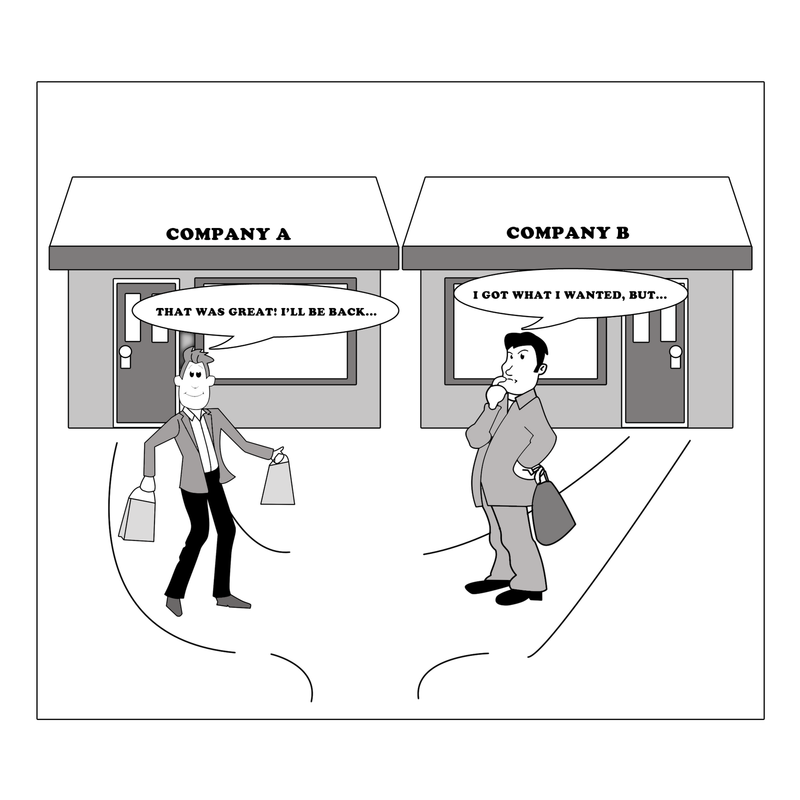 Customers will have expectations whether you understand them or not. They usually consist of outcome factors and process factors and have a zone of tolerance for them to be acceptable. The outcome factors relate to the reliability of the service/product and determine whether the service/product meets the customer's expectations. The process factors relate to the customers experience and will determine if the customer's expectations have been exceeded or not. People know if their expectations have, at least been met. They also know when they haven't. You know this to be true because you are a customer. A very experienced customer. How are you ensuring that you understand the outcome and process factors that affect whether or not you are delivering, at a minimum what your customers expect? Why not use this article to catalyse Conversations That Matter® within your team or organisation. Once you realise that the starting point is understanding expectations, everything else becomes a whole lot easier. All you have to do is ask people what they want, and then do your best to deliver that to them. Gary Ryan explains that organisations need to consider the value that they provide to their global, regional and local communities. In doing so organisations create a sustainable relationship with their community and it is critical that they communicate the value they provide. Sustainability means many things these days. It includes environmental issues and the methods and approaches we humans are using to ensure that our earth is habitable for humans in the future. It also means organisational sustainability which has been brought to everyone’s attention by the Global Financial Crisis. Organisations must be financially responsible to ensure they survive into the future. They must also be sustainable within our local communities, creating jobs and contributing to the local economy within which our organisations operate. In this way service excellence can be a tool to assist Organisations in identifying and outlining their value to their community. 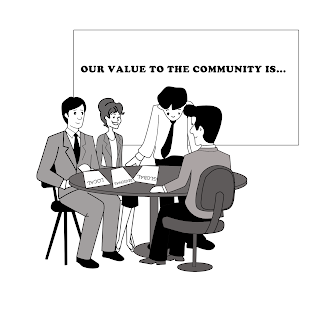 What is the value that your organisation provides to its community from the highest to the most local levels? When it is all said and done, if we disrespect the communities within which we live, we’re out of business. Gary Ryan explains five dimensions that need to be understood if you wish to meet and exceed customer expectations. Research by Parasuraman, Berry and Zeithaml (1991) and re-enforced by many others established that customer expectations are generally fairly basic. They expect organisations to do what they are supposed to do. The more they pay the higher the level of service they expect, but they don’t expect poor service just because they may pay a low price. There is a basic level of service that is expected irrespective of price. An interesting finding is that customers expect organisations to ‘play fair’. There are five dimensions to customer expectations. 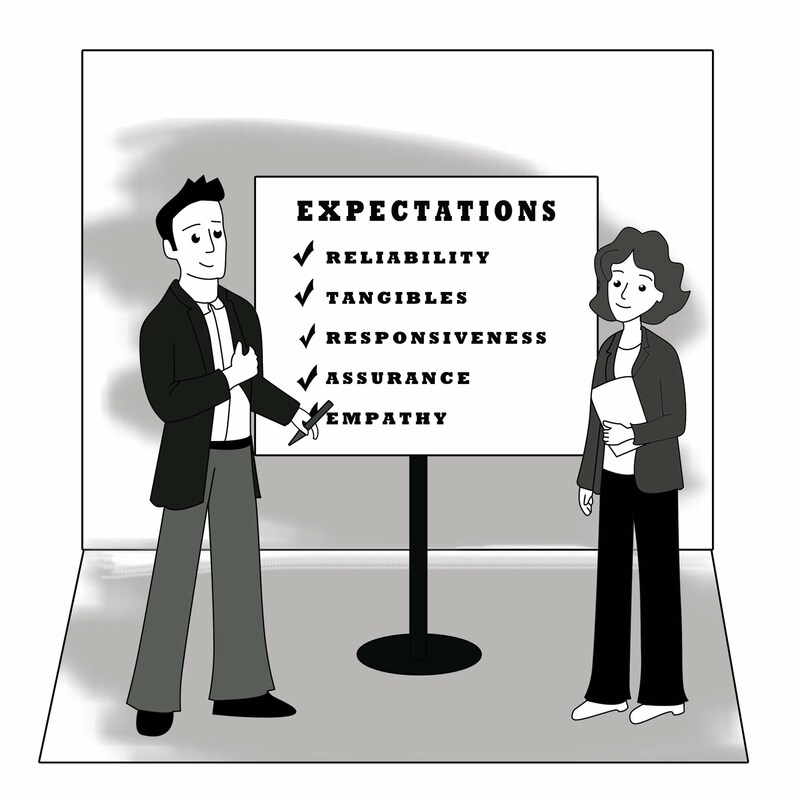 These include reliability, tangibles, responsiveness, assurance and empathy. Reliability is the outcome of the service. Tangibles usually relate to the appearance of the physical features of the service while the service is being experienced. Responsiveness is the willingness to assist and to provide prompt service when the service is being experienced. Assurance is the knowledge of employees and their level of courtesy while the service is being experienced. Empathy is the ‘care factor’ shown by employees. Do they genuinely care about their customers? The reliability dimension is critical with regard to meeting customer expectations. The other four dimensions are critical in exceeding customer expectations. 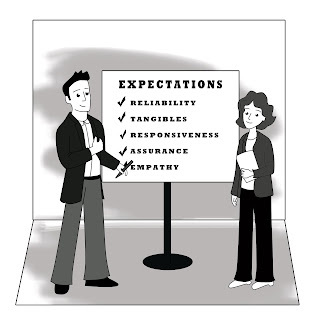 Finally, customer expectations include a range from a desired level down to an adequate level. The range can vary from customer to customer and from service/product to service/product. Let's look at a common internal service, salary processing. Let's assume that the system is set up for people to be paid on a Tuesday night. When people wake up on a Wednesday morning they expect their pay to be in their bank account. Assuming their has been a hiccup in the system, receiving their pay sometime on Wednesday morning may represent the adequate level of the service for most people. Wednesday afternoon may be too late for the majority of people and their focus may have shifted from performing their jobs to worrying about when they will be paid. Not a good scenario! The range of tolerance for the customer expectations associated with this service will have been exceeded. The point here is that most services and products have a range of tolerance. This issue is, do you know the range for your products/services. If you go beyond this range of tolerance then you will have little if no chance of meeting the expectations of your customers. Knowing the expectations of the people you serve is paramount if you want to be successful. Initially created by research Chris Argyris, the Ladder of Inference was thrust into business and management education programs by Peter Senge. You can read (and listen) to an old post on this topic here. In addition I believe that reading different people's perspectives on this topic helps you to increase your understanding of it. In this context please read this short article by Seth Kahan. When have you caught yourself jumping to conclusions? What did you do to prevent yourself from taking ineffective actions?